Whether you are new to the area, just passing through or are looking for new ideas, you should know about 5 fun things to do in Westerville, Ohio. While the entire state has plenty of beauty as well as attractions to visit, there is just something unique to the Westerville area you cannot find anywhere else in the state. Find out what this quaint city has to offer as part of the 5 fun things to do in Westerville. A favorite among locals, this 18-hole regulations gold course is medium length and speed with three sets of tee boxes, which make it a fun but difficult experience unique from many other golf courses. In fact, for 14 of the holes, you will encounter water hazards which add to the challenging experience. Original owner and operator George Stoner may not still be around, but the establishment he built still stands tall. This house, which was constructed in 1862, has a rich history all its own. The home is built on top of a natural spring that many believe has medicinal purposes. Come see for yourself and check out the antique building, which has served as a spa, tavern, inn and even acted as a hiding place for escaped slaves, at one time. Parkside Equestrian is a great source of entertainment and glee for the whole family. It is considered an amusement and recreation park and you and your entire family. In fact, almost every list of 5 fun things to do in Westerville with kids includes Parkside Equestrian at the top of the list. This area is perfect for strolling through, enjoying the scenery and getting a real feel for what Westerville, Ohio is like. You’ll find some unique shops, such as browsing through Amish Originals Furniture Company, that are unique to the area. 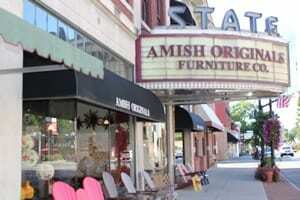 If it’s quality, handcrafted furniture you’re after, Amish Originals is a must visit while in town. Dine, shop and take in the sights in beautiful historic Westerville. Just more than eight miles from the center of Westerville city is the Ohio Historic Preservation. The purpose of the Ohio Historic Preservation Society is to help people connect with and understand the rich history of this beautiful state. So, although this one isn’t directly in the city, it is certainly important enough to be included in the 5 fun things to do in Westerville Ohio list. There’s a reason the city of Westerville is regularly included in multiple listings for America’s Best Places to Live. You will find plenty of parks to enjoy, as well reap the benefits of what the area has to offer students, residents, local businesses and even those who take the time to visit. An online search is sure to help you find any other information you need about the lovely Westerville community and nearby Columbus, Ohio area. Not to mention, more searching will surely help you find more than 5 fun things to do in Westerville Ohio.